The ancient Hebrews from time to time came in contact with peoples who were obviously of different speech, customs, or physique from their own. To these they learned to give names. A whole list of such names is contained in Genesis x., which is a kind of ethnographic survey of the nations known to the Hebrews and inhabiting territory that extended from Mesopotamia, Tarshish, and Abyssinia to the Ægean Archipelago. Many, if not most, of these names occur elsewhere in the Old Testament, showing that they were in use among the people, and were not a mere name-list derived from official or literary records. The arrangement in Gen. x. is on the whole geographical and political, Canaan, for example, being included under the sons of Ham. Evidence of explicit knowledge of these various tribes and nationalities is mainly given, as might be expected, in regard to the inhabitants of Palestine. There appears to have been a tradition that the earlier inhabitants were giants and Anakim, who sometimes bore the names of Rephaim, Zuzim, Zamzummim, Emim, and Avim, while the Horites or "cave-dwellers" are also specially referred to as inhabitants of Seir (Gen. xiv. 5, 6; Deut. ii. 10-12, 20-23). The most numerous inhabitants of the land when the Israelites first entered it are referred to as Canaanites. Sometimes names of more restricted meaning are given to them, as Amorites, Hittites, Perizzites, Hivites, Jebusites, and Girgashites. Of these the Amorites are most frequently mentioned, and are ethnologically the most interesting if, as is claimed for them by Sayce, they were of light complexion and blue-eyed, besides being dolichocephalic or long-headed. This description, however, has been based on the colored pictures of Amorites found on the Egyptian monuments (W. M. Flinders-Petrie, "Racial Types from Egypt," London, 1887), and which to a certain extent are conventional. The Hivites, who were found both in the north (Josh. xi. 3) and in Shechem (Gen. xxxiv. 2), are sometimes called Amorites, and are consequently ethnologically connected with them. So, too, were the Amalekites, with whom may be reckoned the Kenites and Kenizzites (ib. xv. 19; Num. xxiv. 20, 21), who were nomads of southern Palestine. Two other tribes which are mentioned as dwelling in Canaan were probably immigrants like the Hebrews: the Philistines on the southwest coast are stated to have come from Caphtor (regarded by some scholars as the coast of Asia Minor), and were, therefore, possibly of Aryan origin; and the Hittites, found in both the north and south of Canaan, were related to the inhabitants of the Hittite empire in northern Syria. These latter have been connected ethnologically by Jensen with the modern Armenians, but his argument is not convincing. In the immediate neighborhood of the Hebrews are mentioned the Edomites or Idumeans (south of the Dead Sea) and the Moabites and Ammonites (east of that sea), who were regarded by tradition as racially connected with the Hebrews, while still farther to the southeast the Ishmaelites of Arabia were also similarly connected. Other tribes of Arabia are mentioned, as the Joktanites in the extreme south of Saba (Gen. x. 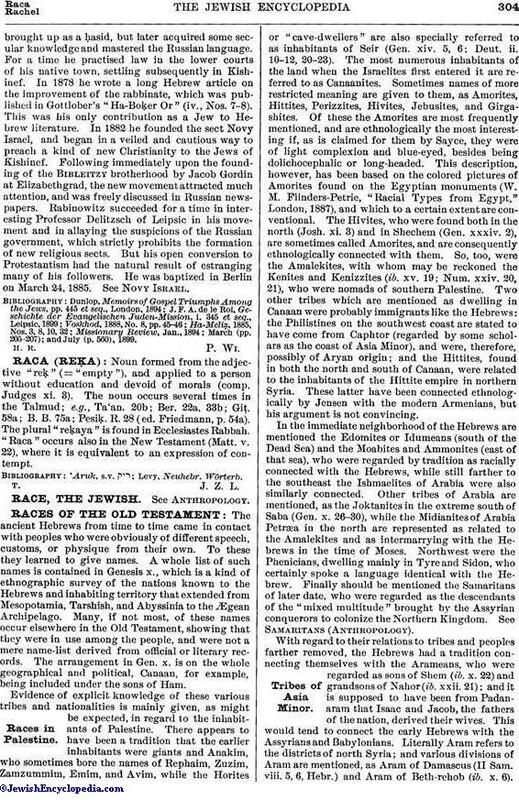 26-30), while the Midianites of Arabia Petræa in the north are represented as related to the Amalekites and as intermarrying with the Hebrews in the time of Moses. Northwest were the Phenicians, dwelling mainly in Tyre and Sidon, who certainly spoke a language identical with the Hebrew. Finally should be mentioned the Samaritans of later date, who were regarded as the descendants of the "mixed multitude" brought by the Assyrian conquerors to colonize the Northern Kingdom. See Samaritans (Anthropology). With regard to their relations to tribes and peoples farther removed, the Hebrews had a tradition connecting themselves with the Arameans, who were regarded as sons of Shem (ib. x. 22) and grandsons of Nahor (ib. xxii. 21); and it is supposed to have been from Padanaram that Isaac and Jacob, the fathers of the nation, derived their wives. This would tend to connect the early Hebrews with the Assyrians and Babylonians. Literally Aram refers to the districts of north Syria; and various divisions of Aram are mentioned, as Aram of Damascus (II Sam. viii. 5, 6, Hebr.) and Aram of Beth-rehob (ib. x. 6). The knowledge of the Hebrews with regard to persons of Aryan descent was somewhat limited. The ships of Solomon seem to have gone to Tarshish, in Spain; Cyprus is known as Chittim; and the Greeks of the Asiatic continent were known as Ionians under the name of Javan. Later the Persians became known. The Aryans of Armenia did not enter that country until the seventh century B.C., when they followed the Medes. Before that time this part of Asia Minor was inhabited by the Tabareni and Moschi, the Tubal and Meshech of the Old Testament. Other tribes of this neighborhood were referred to as Gog or Magog; both terms are possibly but not probably derived from the name of the King of Lydia known in Greek history as Gyges, whence would come the Assyrian form "Mat-Gugu" (the country of Gyges). 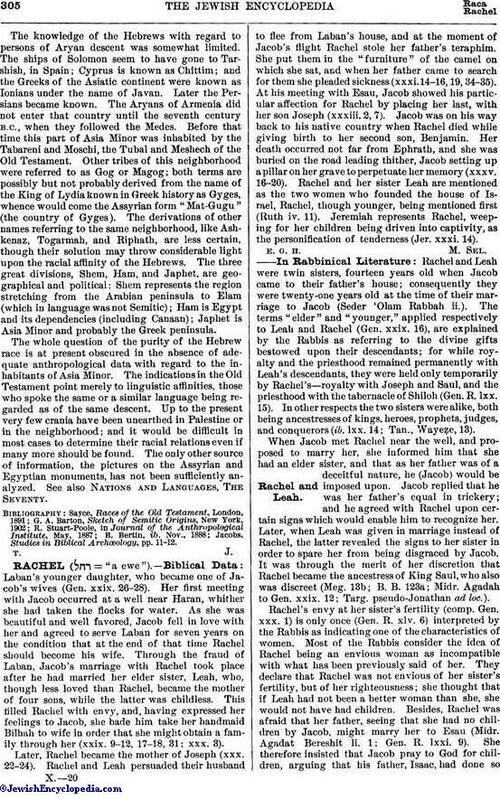 The derivations of other names referring to the same neighborhood, like Ashkenaz, Togarmah, and Riphath, are less certain, though their solution may throw considerable light upon the racial affinity of the Hebrews. The three great divisions, Shem, Ham, and Japhet, are geographical and political: Shem represents the region stretching from the Arabian peninsula to Elam (which in language was not Semitic); Ham is Egypt and its dependencies (including Canaan); Japhet is Asia Minor and probably the Greek peninsula. The whole question of the purity of the Hebrew race is at present obscured in the absence of adequate anthropological data with regard to the inhabitants of Asia Minor. The indications in the Old Testament point merely to linguistic affinities, those who spoke the same or a similar language being regarded as of the same descent. Up to the present very few crania have been unearthed in Palestine or in the neighborhood; and it would be difficult in most cases to determine their racial relations even if many more should be found. The only other source of information, the pictures on the Assyrian and Egyptian monuments, has not been sufficiently analyzed. See also Nations and Languages, The Seventy. Jacobs, Studies in Biblical Archœology, pp. 11-12.